Regions and chartered cities of Ethiopia, also knows as states, in 1992. Wikicommons/Golbez. Some rights reserved. René Lefort, in his recent article, (openDemocracy, 21 October 2018), regrets the “sudden and total loss” of TPLF (Tigray Liberation Front) hegemony that gave Ethiopia, according to him, “unquestionable economic successes” and political stability for over two decades. But, Lefort’s assertion does not withstand scrutiny. In the first place, Lefort does not tell us why the replacement of TPLF by the second generation of OPDO (P. M. Abiy Ahmad and his group) at the centre is a leadership crisis. The Prime Minister was elected democratically by the ruling coalition with an overwhelming majority and the TPLF as a member of that coalition should respect the outcome and support the new leadership. Lefort’s idea of rapprochement is undemocratic and diverts attention from the real issue. The source of the ongoing instability in Ethiopia is the kilil system. Kilil has created fragmented markets and isolated peoples, fighting continuously among themselves for territory. P. M. Abiy Ahmad and his group have shown a remarkable acumen in trying to change the political culture in Ethiopia. They have despised violence and espoused peaceful means of resolving differences, something new in the history of the country. Turning TPLF’s anti-Amhara, anti-Ethiopia propaganda on its head, they have embraced tens of millions of Ethiopians, who have been disenfranchised in their own country for so long by a racist and cruel kilil system. P. M. Abiy Ahmad and his group inherited the kilil system, they did not create it. They are concerned about the unfair treatment of millions of mixed descendants by the kilil system. They have shown an interest in listening to ideas about alternative arrangements that will treat all citizens equally and fairly. At the same time, they understand their constraints on moving forward because the TPLF, the chief architect and beneficiary of the kilil system, is still in the ruling coalition. These “conditions”, of course, cannot be ignored. 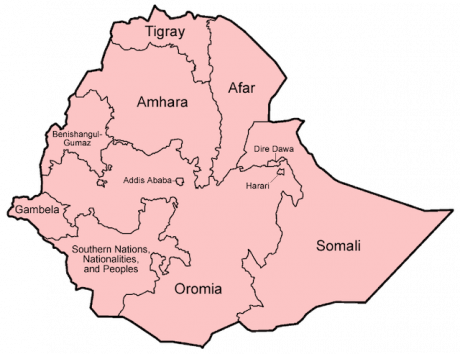 The TPLF can leverage its military force amassed in Tigray to shake down the centre. In the long run, however, these “conditions” will backfire. Tigray is still poor and relies heavily on the centre for its survival. Over one million people in Tigray are dependent on a food assistance program. In the short run, these threats may impede reforms. No wonder the new leadership has chosen to talk about a multinational state rather than one Ethiopian nation. A multinational state, however, cannot resolve the interethnic rivalry and endless territorial disputes that are threatening to tear the country apart. Such a state will still deny the tens of millions of mixed-descendants equal citizenship. In Ethiopia, the kilil system was crafted twenty-eight years ago by victorious ethno-nationalist rebel groups (TPLF & OLF) for their own self-interest. In Ethiopia, the kilil system was crafted twenty-eight years ago by victorious ethno-nationalist rebel groups (TPLF & OLF) for their own self-interest. Consequently, the system has not allowed the involvement of all groups and interests of the society at the state center. Only a democratic transition will ensure all groups and interests of the society adequate share in the sovereignty and wealth of their country. However, a democratic transition is not self-willed. Nor is it imposed from the top. A democratic transition is compelled by compromises between compatible groups – so that everyone should get something, and no one should get everything. In the case of Ethiopia, such compromises may be worked out between the ethnonationalist camp, on the one hand, and the one-people-one-Ethiopia camp, on the other. Therefore, the recent push for one-people-one-Ethiopia is a welcome development. It has potential to induce a democratic transition.